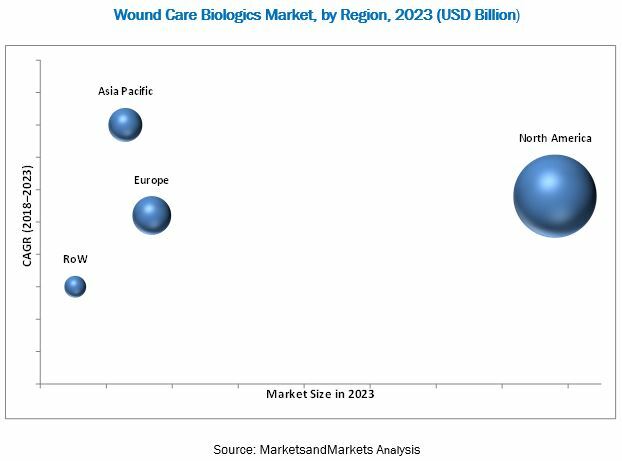 [123 Pages Report] The wound care biologics market is expected to reach USD 2.26 Billion by 2023 from USD 1.29 Billion in 2017 at a CAGR of 9.8%. The base year for this study is 2017 and the forecast period is 2018–2023. Top-down and bottom-up approaches were used to estimate and validate the size of the global market and the size of various other dependent submarkets. The overall market size was used in the top-down approach to estimate the sizes of other individual submarkets (mentioned in the market segmentation—by product, wound type, end user, and region) through percentage splits from secondary and primary research. The bottom-up approach was also implemented (wherever applicable) for data extracted from secondary research to validate the market segment revenues obtained. The major players in wound care biologics market are Smith & Nephew (UK), Mölnlycke Health Care AB (Sweden), Integra LifeSciences Corporation (US), Wright Medical (US), MiMedx Group (US), Vericel Corporation (US), Anika Therapeutics (US), Osiris Therapeutics (US), Organogenesis (US), Kerecis (Iceland), Solsys Medical (US), ACell (US), and Marine Polymer Technologies, Inc. (US). The global wound care biologics market is expected to reach USD 2.26 Billion by 2023 from USD 1.42 Billion in 2018, at a CAGR of 9.8%. Market growth is mainly driven by factors such as the increasing incidence of diabetic foot ulcers, increasing geriatric population, and increasing burn injuries globally. On the other hand, the high cost of wound care biologics and the higher rejection rate associated with skin grafts & substitutes will restrain the growth of this market. The global market is segmented on the basis of product, wound type, end user, and region. By product, the market segmented into biological skin substitutes and topical agents. The biological skin substitutes segment is estimated to account for the largest share of the market in 2018. The rising incidence of hard-to-heal wounds and their growing adoption (due to their high efficacy) are driving the growth of this product segment. The biological skin substitutes segment is further categorized into human donor tissue-derived products, acellular animal-derived products, and biosynthetic products. On the basis of wound type, the market is segmented into ulcers, surgical & traumatic wounds, and burns. In 2018, the ulcers segment is expected to account for the largest share of the market. 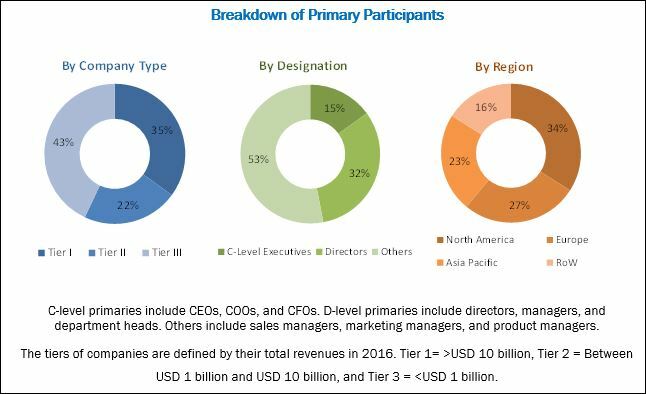 Market growth can primarily be attributed to the widespread adoption of wound care biologics for the treatment of ulcers and burn injuries in developed countries and the high incidence rate of diabetic foot ulcers. On the basis of end user, the market is segmented into hospitals, ASCs, and burn centers & wound clinics. In 2017, the hospitals segment accounted for the largest share of the market. Hospitals are the largest end users of wound care biologics, as most of the wound care treatment using biologics are conducted in hospital settings. On the basis of region, the market is segmented into North America, Europe, Asia Pacific, and the Rest of the World (RoW). In 2018, North America is expected to command the largest share of the market. The large share of this segment can primarily be attributed to the high presence of key players in this region, the availability of a variety of wound biologics products, and the high prevalence of diabetic foot ulcers this region. However, the Asia Pacific market is estimated to register the highest growth during the forecast period primarily due to the presence of a large patient population, increasing penetration of key market players, and the large number of research and development activities for wound care biologic products. Some of the major players in the wound care biologics market are Smith & Nephew (UK), Mölnlycke Health Care AB (Sweden), Integra LifeSciences Corporation (US), Wright Medical (US), MiMedx Group (US), Vericel Corporation (US), Anika Therapeutics (US), Osiris Therapeutics (US), Organogenesis (US), Kerecis (Iceland), Solsys Medical (US), ACell (US), Lavior Inc. (US), and Marine Polymer Technologies, Inc. (US). These companies have products for all end users in this market, a strong geographical presence, and a focus on continuous product innovation.